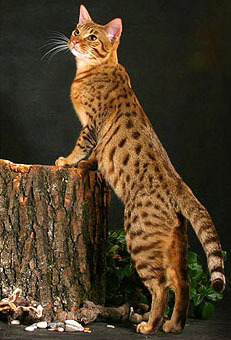 Many people are drawn to the Ocicat because of its appearance. This exotic-looking cat makes people stop and stare, but not many know about this man-made cat. The Ocicat was the result of an experimental breeding program in 1964 while trying to breed an Any-point Siamese, by a cat breeder by the name of Virginia Daly, who lived in Berkley, Michigan. Her daughter gave the cat the name Ocicat, because of the resemblance to the Ocelot (wild cat) and the name has now been given to the entire breed. The Ocicat (Abyssinian and Siamese) was later crossed with the American Shorthair, which gives the cat its silver colors. The broad gene pool also gives the Ocicat a broad genetic background making for a healthy breed. They are known to live as long as eighteen years! The first Ocicat was neutered and sold as a pet. But, when the parents mated again, their litter included many kittens that resembled the first Ocicat and these became the founding line of the Ocicat breed. Ocicats have twelve colors that are recognized for show competitions. The approved colors are tawny, blue, chocolate, cinnamon, dilute class, silver, fawn, blue, lavender, and any of them with silver: blue silver, ebony silver, fawn silver, cinnamon silver, chocolate silver et cetera. The most noticeable characteristic of the Ocicat is its resemblance to its wild cousins, although, in fact, its DNA has no wild gene. They are a mixture of the Abyssinian, Siamese and later American Shorthair cats. The Ocicat is a large, athletic animal with a solid and well muscled body. It has a short light coat that glows with a satin sheen. Ocicats are medium sized, shorthaired cats. Males can weight anywhere from 9 to 14 pounds (4-6 kg.) and sometimes more, while the female Ocicat usually weigh around 6 to 9 pounds (3-4 kg.). The eyes are almond-shaped. With the exception of blue, all eye colors are possibly. Their larger boned, muscular body makes them look heavier than they actually are. The ears at a 45 degree angle. Although wild looking, temperament wise they are not. Like most cats, the Ocicat is a curious, playful, active creature. The Ocicat is full of energy. The Ocicat is an outgoing breed and are extremely dog-like. Some Ocicats can be trained to fetch, walk on a leash, and other basic commands like come, sit, lie down, stand, sleep and even speak! This is usually something one would associate with a dog. They like playing with toys and enjoy splashing in water. Ocicats are very intelligent, very people-friendly and are considered to be extremely devoted to their owners. Because of their intelligent nature, you should keep them challenged by giving them puzzle toys and teaching them tricks. They do not always like staying home alone. They are very friendly to strangers and devoted to their owners which makes them a perfect family pet. The Ocicat is a fairly healthy breed with no specific health problems to the breed. Their diet is the same as any other domestic cat. Ocicats have short, satiny coats which require very little grooming. Just the occasional brushing and bathing will do. As not to ruin their satiny coat, a rubber curry brush should be used when grooming. The rest is the basic care giving to any cat: vet visits, nail trimming, etc. Ocicats love the company of people and need cat-friendly people who can spend a lot of time with them. This cat is so cute I’ll buy it!!! I have an ocicat of my own, and the breed is typically a great companion. Sure, my cat is obese, but he lets me use his tummy as a pillow. My cat is a cinnamon ocicat, which is just basically orange. He is perfect, and I think anyone who wants to adopt a cat should consider an ocicat. Are then related to the Ocelots? Do you need special permits for them? Im know there is another ex-wild domescated cat with a circle on its side, that I cant find, I thought it was the Ocelot but thats a wild cat. Whats the price of a Ocicat? How big do they get? No Ocicats are a fully domestic breed which occured when a breeder crossed a Siamese with an Abyssinian. She immediately though of an Ocelot because of the coloring and spots and called it an Ocicat. There is no wild blood in it. No permits needed. No – the Ocicat has NO wild blood in the background. I have two show cats – one cinnamon and one chocolate-silver Oci – both have done very well at the shows. i have come by an ocicat by accident she came to us at about 2 weeks old after being thrown out of a truck window….someone just threw her out…so being the person i am i took her in not knowing what type of cat she was….but wow! i feel very lucky!!!! i have a cat just like that he is just like a dog!! My mom and I adopted a cat from Petco. Her information said “Michelle is not pregnant, just curvy.” She has short legs, a fat body, her head is pretty small, and her fur is fairly short but coarse. Does anyone know what type of cat she is? We feel like she may have been abused in the past as she tends to nip at anyone who tries to pet her. She chases her tail which is super cute! My Ocicat was on the darker side. He got along great with my Siamese. They were real close buddies. Between the two of them, on Christmas Eve, they opened every tore open every gift. They had paper, ribbons and bows everywhere. The sad part was my Ocicat suffered from a rare brain disorder found in cats whose background somewhere along the lines was inbred. I had to put him to sleep. He was only 4yrs. His buddie “Blue” grieve for a long time. Sadly todat I had to put my “Baby Blue” to sleep. He was only 11yrs old. I have a Bengal, also. He is only 4 byt he has had rough live before I got him 2 months ago. He was kept in a cage until he was 2 and then given away. He has eye that we think he is blind in because he is a little jumpy. I got him from a older lady who just let him do anything he wanted so he was not really trusting at first..